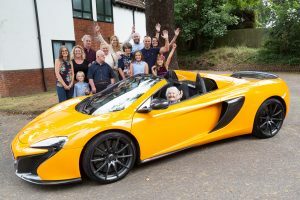 STILL loving life in the fast lane, a sprightly centenarian thoroughly enjoyed taking a spin in a £215,000 supercar when she celebrated her birthday on Sunday with her family. Margaret’s family helping her to celebrate her 100th birthday while she is sitting in style in this McLaren 650 Spyder. Margaret Rapley’s surprise trip in a bright orange McLaren 650S Spider was arranged by grandson Stuart Holloman, who works for the Woking Formula 1 company that makes the car. Margaret, who lives at Stokefields retirement home in St John’s Hill Road, was 100 years old on Monday. Family members, including daughters Carol and June and son David, arrived on Sunday for a tea party and to watch as she set off for her dream drive.They also enjoyed sharing her infectious smiles as she opened her birthday card from The Queen while an entertainer sang her favourite songs. “She was really pleased to see everyone and had a great time being driven around in the car,” said Stuart. Fairy cakes were served to the birthday girl and fellow residents on Monday as they enjoyed the home’s monthly musical entertainment, rearranged specially for the occation. Mrs Rapley, who has been at Stokefields since August 2015, previously lived for many years in Old Woking and Westfield. She was born in Newcastle during the First World War.